If eating fruit is a bit of an alien concept to you then read on! Aside from being extremely healthy it’s also the perfect snack food as many varieties are ready to eat and can be tucked in a bag or munched on the way to college with ease. However, as well as being great as it is, there are many other culinary uses for fruit and it’s good to learn a few basic techniques for cooking with this sweet, diverse and deliciously versatile set of ingredients. 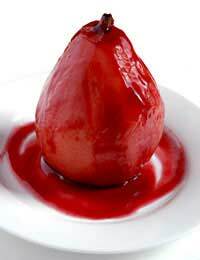 Many types of fruit can be poached but a real classic is pear. It’s very easy to prepare and it makes a really light and refreshing dessert. You can do a lot of the preparation in advance so there’s not too much work involved on the night and you don’t need to be an expert in the kitchen to produce a passable poached pear. 2 pears, peeled but stalk left intact. Pour the wine into a saucepan just big enough to hold the pears and bring to a simmer. Add the cinnamon stick, ginger and caster sugar and stir to mix. Place the pears in the pan on their side so that the wine covers them and they poach evenly. Cover the pan and poach for about 30 minutes, checking every so often. Serve the pears with a little of the poaching liquid spooned around them. You might remember baked apples from school dinners or trips to your grandparents but there’s a reason why this is a bit of a childhood classic. It’s a proper winter warmer and another easy dish to make and the ingredients are cheap and readily available. Here’s a really quick and easy recipe that takes just minutes to prepare and then the oven does the rest of the work. Cut a strip of skin away from the circumference of the apples, using a vegetable peeler or large knife. Remove the apple cores and cut a small slice from the base of each apple so they stand in the dish. Mix the sugar, butter, raisins, cinnamon and nutmeg together in a small bowl then carefully spoon the mixture into the apples. Place any remaining mixture in the base of an ovenproof dish then stand the apples on top. Dot the butter over the apples and cook for about 50 minutes. Serve with custard. Aside from these two well-known cooking treatments for humble fruit varieties, you can steam, microwave, fry and griddle various types of fruit. Berries are a good example of fruit that’s good to steam. It’s a great way to make use of a glut of seasonal berries and the resulting dish can then be frozen and used for anything from crumbles to coulis. Apples work well in the microwave and again, these are good for using in crumbles and pies.